For years Kevin Delaney’s hockey trajectory mostly resembled a flat line. Toiling in Edina’s massive youth system as an undersized B-teamer, Delaney’s varsity prospects hovered somewhere between slim and none. Even Delaney, who played at the Junior Gold B level as a freshman, at times wondered if he was varsity material. There’s no doubting Delaney’s abilities now. 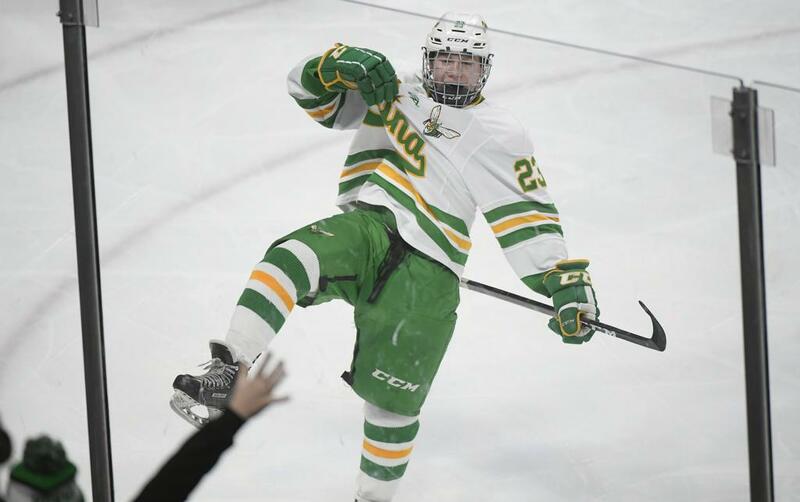 The 5-9, 155-pound forward flashed his varsity bona fides on the ultimate of stages Saturday, scoring a goal in the third period and then adding an assist to help the Hornets rally past Eden Prairie 3-2 in overtime in the Class 2A state championship game. Delaney’s goal, which tied the score 1-1, came after he stripped the puck from an Eden Prairie defender, raced to the slot and fired a shot past Eden Prairie goalie Axel Rosenlund’s catching glove. Delaney’s tenacious forechecking set up Edina’s second goal just 22 seconds later. He whacked the puck off an Eden Prairie defender’s stick, sending it to linemate Brett Chorske in the corner. Chorske fed Peter Colby, who ripped a shot from the slot to put Edina up 2-1. Delaney played two years of Pee Wee hockey and one of Bantam at the B2 level. As a second-year Bantam he made the jump to B1. With so many players ahead of him at the A and AA levels, Delaney’s ascension to state tournament hero is nothing short of remarkable. “The path, I wouldn’t have chosen it any different,” said Delaney, who finished the season with 20 goals and 15 assists on the Hornets’ second line.